HMAS Anzac deployed on manoeuvres. The Anzac's combat system includes a BAE Systems (formerly United Defense) 127mm mk45 mod 2 naval gun. An SH-2F naval helicopter on HMNZS Te Kaha F77. Anzac will be retrofitted with the evolved Sea Sparrow missile (ESSM) which entered service with the Australian Navy in June 2004. HMNZS Te Kaha (F77) on exercise in the Southern Ocean. HMAS Perth (FFH 157) Anzac Class frigate of the Autralian Navy. In November 1989, the Australian / New Zealand frigate building project contracted Australian shipbuilders Tenix Defence Systems to construct ten Anzac Class frigates; eight for Australia and two for New Zealand. The first frigate for the Royal Australian Navy (RAN), HMAS Anzac, was commissioned in May 1996. The other hulls are: HMAS Arunta (FFH 151), commissioned December 1998; HMAS Warramunga (FFH 152), March 2001; HMAS Stuart (FFH 153), August 2002; HMAS Parramatta (FFH 154), October 2003; HMAS Ballarat (FFH 155), June 2004; HMAS Toowoomba (FFH 156), October 2005; HMAS Perth (FFH 157), August 2006. The two frigates for New Zealand, HMNZS Te Kaha (F77) and Te Mana (F111), were commissioned in July1997 and December 1999. Tenix Defence Systems (now part of BAE Systems Australia) is the prime contractor, with responsibility for design and systems integration of the ship; subcontractor Blohm + Voss Australia provides the platform design and combat system integration; and Saab Systems Australia provides electronic integration and combat system design. The 3,600t frigates were built at Tenix’s Williamstown yard in Victoria, Australia. The design is based on the Blohm + Voss Meko 200 modular design which utilises a basic hull and construction concept to provide flexibility in the choice of command and control, weapons, equipment and sensors. "The first frigate for the Royal Australian Navy, HMAS Anzac, was commissioned in May 1996." In March 2003, HMAS Anzac was deployed in support of coalition forces in Operation Iraqi Freedom. Both of the New Zealand frigates were deployed in support of Operation Enduring Freedom. In February 2010, a major upgrade to the Royal New Zealand Navy (RNZN) frigate Te Kaha was completed. In December 2010, The RNZN frigate Te Mana returned to service after a seven-month refit programme. Both frigates were fitted with new diesel engines for improved performance and reduced fuel costs. The Anzac’s combat data system is built around the Saab Systems 9LV 453 mk3 combat management system, with link 11 and SHF satellite commmunications. The 9LV mk3E is fitted in the last vessel for the RAN. MILSATCOM communications system has been installed in HMAS Warramunga and subsequent vessels, which facilitates joint exercises with US and allied navies. Weapons control is managed by the Saab Systems 9LV 453 optronic director with Saab Systems J-band radar. Raytheon CW mk73 is the fire control system for the Sea Sparrow missile. This has been replaced with the CEA Technologies I/J-band solid-state continuous-wave illuminator transmitter (SSCWI) on Warramunga and will be fitted to all Anzac vessels. The Anzac is armed with one eight-cell mk41 vertical launching system for Nato Sea Sparrow surface-to-air missiles. Sea Sparrow is a semi-active radar missile with a range of 14.5km. Sea Sparrow has been replaced by the evolved Sea Sparrow missile (ESSM) in HMAS Warramunga, Stuart and Parramatta, increasing the capacity from eight to 32 missiles, and the weapon system was declared operational on these vessels in June 2004. ESSM will be retrofitted in the first two Australian ships. HMAS Warramunga was the first vessel in the world to be fitted with the ESSM. ESSM has been developed by Raytheon with an international cooperative of ten Nato countries and is designed to counter high-speed anti-ship missiles. It has the same semi-active radar guidance and warhead as the Seasparrow but has a new rocket motor and tail control to provide increased speed, range and manoeuvrability. ESSM was passed for full-rate production by the US Navy in April 2004. "HMAS Anzac was deployed in support of coalition forces in Operation Iraqi Freedom." Capacity to launch eight Boeing Harpoon block II anti-ship missiles has been added under project SEA 1348 Phase 3A. First vessel to receive the Harpoon launcher was Warramunga in December 2004. Seven vessels have received the modification and the eighth, Perth, was completed in September 2008. Harpoon Block II missiles have new inertial / GPS (global positioning system) guidance for precision targeting. The main gun is a BAE Systems Land & Armaments (formerly United Defense) 127mm mk45 mod 2 gun, which can fire at a rate of 20 rounds a minute to a range of over 20km. The SEA 1348 Phase 3C project installed the Petrel Mine and Obstacle Avoidance Sonar (MOAS) system in all of the ANZAC Ships by September 2008. The HMAS Perth was installed with these capabilities on schedule. Two triple 324mm mk32 torpedo tubes for mk46 anti-submarine torpedoes are fitted. Mk46 is an active / passive torpedo with a range of 11km. In 2004, the RAN ordered the Eurotorp MU90 advanced lightweight torpedo, which has been fitted to all Anzac frigates. MU90 is 3m long, weighs 300kg and has a range of more than 10km. HMAS Toowoomba, the first vessel to be fitted with the new torpedo, completed a first test firing of the MU90 in June 2008. The frigate is equipped with Thales Defence Sceptre A radar warner. Decoy systems consist of SLQ-25A towed torpedo decoys and mk36 launchers, initially for Sea Gnat decoys but now used to launch BAE Systems Australia Nulka anti-missile hovering offboard decoy, which provides protection against radio frequency seeker anti-ship missiles. Air search is by Raytheon SPS-49(V)8 ANZ radar, operating at C/D band, and air / surface search by Sabb Microwave Systems (formerly Ericsson) Sea Giraffe G/H-band radar. The I-band navigation radar is the Atlas Electronik 9600 ARPA. Thales Underwater Systems Pacific Spherion B hull-mounted sonar is fitted. Spherion B is a medium frequency, active search and attack sonar. A Kariwara towed array sonar may be fitted. In December 2003, Thales Underwater Systems Pty Ltd was awarded a contract to supply the Petrel mine and obstacle avoidance sonar for the Anzac. Installation was completed in HMAS Arunta in September 2005. The final ship to be fitted, HMAS Perth, was complete by the end of 2008. 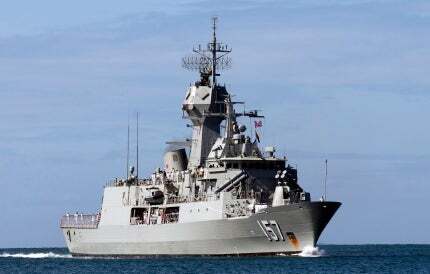 In August 2008, Kelvin Hughes was awarded a contract to supply the SharpEye navigation and tactical surface surveillance radar for the upgrade of the Anzac frigates. In December 2003, the Australian Department of Defence announced a project to upgrade the Anzac Class anti-ship missile defences (ASMD). The contract for the first phase was signed in May 2005 with the ANZAC alliance between Tenix Defence (now BAE Systems), Saab and the Department of Defence. A previous programme, the ANZAC warfighting improvement programme, was cancelled in 1999. The first phase of the ASMD programme includes the upgrade of the command and control system to the Saab 9LV Mk 3E and installation of: Sagem Vampir NG infrared search and track (IRST) system for detection and tracking of low-level aircraft and anti-ship missiles; CEA Technologies CEAFAR 3D E/F band, fixed active phased array radar for improved fire control against anti-ship missiles which replaces the Saab Sea Giraffe; and CEA Technologies CEAMOUNT active phased array radar system to provide mid-course guidance and terminal illumination for the evolved Sea Sparrow missile. Initially, the ASMD capability is being fitted in a single ship, HMAS Perth, prior to other Anzac vessels being modified. HMAS Perth began fitting out in January 2010. Initial operational capability for the ASMD started in 2011, followed by an operational evaluation period of 12 months. In April 2009, Saab signed a continuation funding contract for progress of SEA 1448 phase 2 project of the Anzac frigates in Australia. The project will cost $840m. Under the project, Saab will integrate CEA Technologies radar and new navigation radars into the HMAS Perth. The funding for the lead ship was approved by the government and the project commenced in January 2010. This upgrade replaced the Saab Microwave Systems Sea Giraffe G/H-band radar. The contract also includes additional funding for implementation of an improved operations room design with additional air warfare capabilities of the ship. Saab Systems, Defence Material Organisation and Tenix (now a part of BAE Systems) signed a three-way partnerhsip contract for enhancement and maintenance of the frigates in April 2007. This contract would replace the Anzac ship alliance that handled capability generation and the in-service support contract that handled capability sustainment. The contractual scope includes nine years of support with provision for extension for six more years. Under the SEA 1448 phases 2A and 2B ASMD project, the team completed the final reviews for the mk3E combat management system in August 2008; received the first phased array radar faces and control equipment in June 2009; and completed HMAS Perth’s new FWD and AFT masts. Further upgrades are scheduled under the joint project 2089 phase 2A (tactical information exchange domain) and Project SEA 1442 phase 4 (maritime communications modernisation). "Each ship is designed to accommodate, operate and maintain its own helicopter." Each ship is designed to accommodate, operate and maintain its own helicopter. The RAN is using its Sikorsky Seahawk S-70B2s initially but ordered 11 Kaman SH-2G Super Seasprite helicopters. Deliveries began in 2001 and the SH-2G(A) received provisional acceptance into service in October 2003. The helicopters were grounded in May 2006, after problems with the flight control system and ITAS software. A review of the programme was initiated in May 2006 and, in May 2007, the RAN decided to continue with the project rather than pursue alternatives. However in March 2008, the RAN finally announced the cancellation of the programme. The helicopters were returned to Kaman for possible sale. The RNZN ordered five SH-2Gs, two for the Anzac frigates. Deliveries completed in March 2003 and all five have entered service. These are armed with the Raytheon Maverick missile. It is driven by a CODOG (combined diesel or gas) turbine system; one GE LM 2,500 gas turbine rated at 33,600hp with a power turbine speed of 3,600rpm; two MTU 12V 1163 TB83 diesels each rated at 4,828hp at 1,200rpm, twin shaft with controllable-pitch propellers. Saab Systems is also to develop a multilink capability for the Anzac Class frigates. The A$43m five-year contractual work, the joint project 2089 phase 2A, began on 24 March 2009. It will provide Nato link 16 and variable message format (VMF) for enhancing the existing Nato link 11. Key technologies to be used in this project include tactical data link systems, digital communication systems, and combat management systems. Northman Grumman mission systems will provide the data link processor. Design activities for the project have already begun.